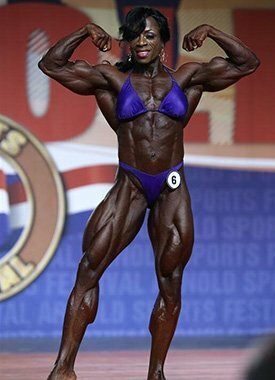 Iris Kyle continues to set a new standard for women's bodybuilding. Her legacy is growing as impressively as her muscles. The crowns being handed to Iris Kyle are now being made by an assembly line, it seems. For a record-setting seventh time, this iron maiden was anointed Ms. International, designating her as the best female bodybuilder on the planet. Kyle's conditioning, symmetry and muscularity are like something from another planet, making her a worthy standard bearer for a sport full of out-of-this-world bodies. There's nothing tepid about her physique; it takes the female form to the edge and keeps going, adding mass where no more development seemed possible. The woman who finished second, Yaxeni Oriquen, has won this contest five times; these women don't leave room at the table for anyone else. Which is the beauty of women's bodybuilding. Muscle accrues gradually; there are not shortcuts, no easy path to the top. Once they're there, they like to stay a while, too. Kyle dominated, but things got interesting from there. Oriquen's second place was controversial. Many observers felt that Debi Laszewski was the second-best bodybuilder on the stage, based on conditioning that was as sharp as cut glass and equally dangerous. Alas, she came in third tonight. Fourth place was reserved for Brigita Brezovac, who came in sixth last year. Her advance up the ranks owed to her well-balanced physique, symmetry and conditioning. Fan favorite Cathy Lefrancois came in fifth. She looked great, especially from the rear view! Her glutes were striated and when she flexed, her hamstrings represented to great effect. What's more, her routines ranked among my favorites this year. Into sixth place fell Angela Debatin, who had taken a four-year year hiatus and was making her comeback tonight. These women are resilient, no doubt about it, and stingy, too: They don't hand off their titles easily or willingly. You want to become Ms. International one day? Best of luck taking that title from the Iris Kyle anytime soon.